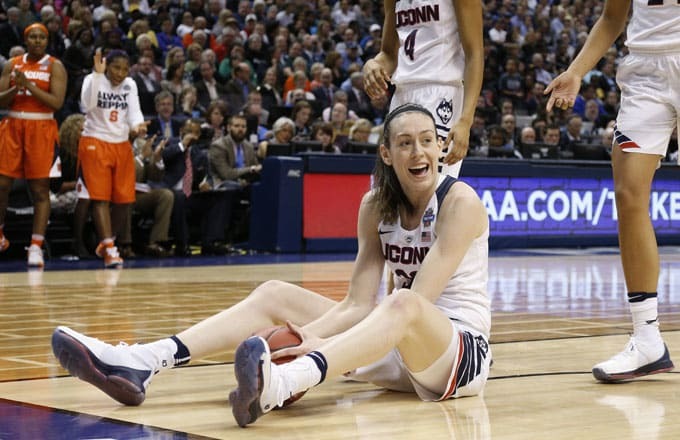 The Seattle Storm&apos;s Breanna Stewart is officially having the best month ever. After leading the women UConn Huskies to their fourth straight NCAA title and earning nearly every possible individual accolade along the way, Stewart was drafted by the Storm as the first overall pick in the 2016 WNBA draft last week. Now, as if she wasn&apos;t already riding high, Stewart has just inked a multi-year deal with Nike. Speaking about the deal, Stewart says that it&apos;s bigger than basketball, and hopes to have a lasting impact on her younger fans. "Being strong and bold while carrying yourself with humility and confidence is something I hope to share with young kids," Stewart said. The recent Swoosh signee with settle into her new role as the Seattle Storm&apos;s power forward/center on May 15 when the team begins the regular season against the Los Angeles Sparks.